Now that Mother's Day is over, it's time to focus on that special guy in your life. Father's Day is about a month away and to help you celebrate the dads in your life, this week I'll be sharing a few of my favorite gifts - including some awesome discounts. I'm kicking this week off with one of my favorite brands out there. Tom & Teddy, offers matching and vibrant swimwear for men and boys made from the best materials and using only exclusive designs. 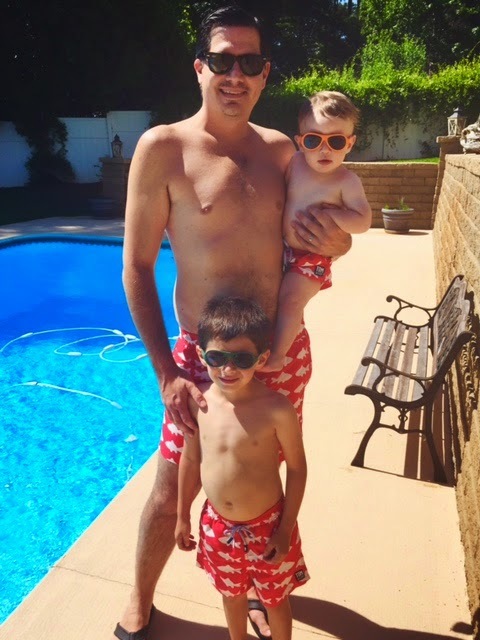 Brad and Jack have been wearing matching Tom & Teddy swim trunks for years but this season this fun experience has become even more special! Dylan is now able to join in the fun and wear his very own first pair. 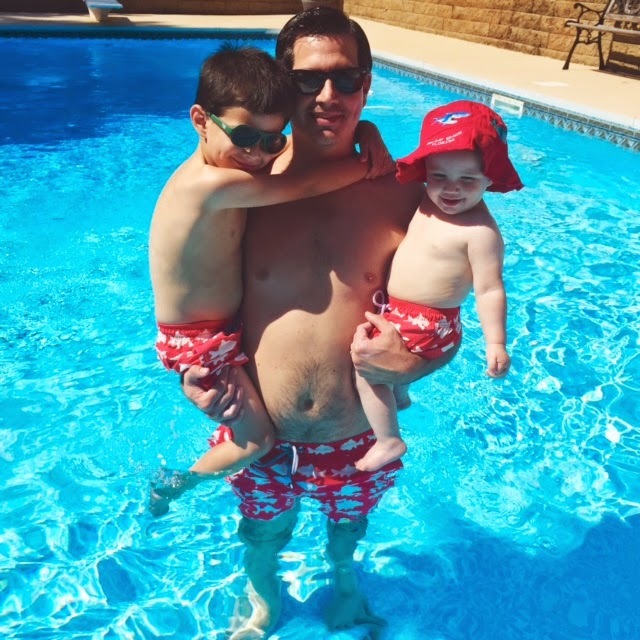 Brad, Jack and Dylan are wearing Red & White Fish swim shorts - for men & boys. Check out this adorable Father's Day inspired video Tom & Teddy has produced! Founded in 2011 by Michelle L’Huillier and Jelle de Jong, Tom & Teddy is a classic and vibrant beachwear collection – for boys and men. Tom & Teddy is all about friendship, shared experiences and that special bond between father and son. It captures the spirit of the great Australian outdoors and the perfect summer’s day by the water. The quick-drying microfibre is salt water and chlorine resistant; this signature fabric is combined with UV protection, providing a soft finish for superb comfort. This is so adorable. What a cute idea.